I came down out of high Suffolk, along the narrow lanes which dogleg through the ridges of rolling fields from Monewden. The sun was high in the sky, but starting to slide westwards. There was birdsong, but also a freshening wind which promised rain by nightfall. I came out onto the surprise of a proper road just north of Otley. Soon, there was a bus garage, an old chapel, and then a shop, more cars and a housing estate. From a map, you might even think Otley was outer-Ipswich suburbia, but this is a large, proper village, with a strong sense of identity. Otley College, famous as 'the agricultural college' in Ronald Blythe's Akenfield, and now reinvented as a further education college soon to be part of the new university, is a couple of miles away on the Ipswich side of the village. 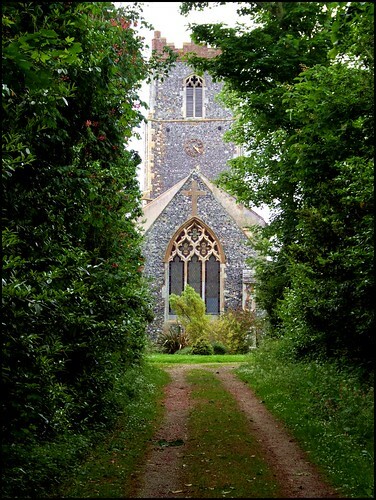 Like most of the churches in the Ipswich area, St Mary was in a poor way by the early 19th century, and was thoroughly renovated by the Victorians. They made a good job of it, and left a lovely example of a fine old village church, with a great sense of continuity, and the feeling of being at the heart of a faith community, at once rustic and yet renewed. You approach from the east, up an avenue of chestnuts, which make a carpet of blossom every spring. There is a large stone cross set in the flint on the outer chancel wall, and the path leads around to the south porch. Just beyond is a beautiful 14th century west door, beneath the 15th century tower. It has been limewashed in the approved manner, and has some delightful carvings on it, including three figures. Beside the vestry entrance is a memorial in Latin to Alfred William, third son of Henry Gretton, Rector of this church, and Mary, his wife. Fell asleep in the Lord on the 14th day of July 1894, aged 18. Henry Gretton was an enthusiastic Tractarian, who inherited a church which had already been serviceably restored in the 1840s. His influence has left an interior which is High Church in character, but with a number of interesting survivals. The remains of an ancient stoup stand to the right of the entrance, and you step into an open space with a south aisle to the right. On the left is a rather curious window naming the Christian virtues in the lush style of the 1890s. Turning east, the clerestory is on both sides, and the font is handsome, but has been well and truly vandalised. This was probably done by the Anglican reformers of the 1540s, a hundred years before the arrival of Dowsing, who also gave this church a very thorough seeing to. He doesn't mention the font, but tells us that his enthusiastic deputy, Thomas Denny, not only wrecked the twenty angels on the roof beams and the gable cross on the chancel, but 2 brasses and 50 stained glass windows. He also mentions wrecking pictures of Moses and Aaron, which probably flanked the decalogue, as in the later ones at Chediston and Somersham. There is every reason to believe that Dowsing had a warm welcome here, as we shall see. The pews are mostly 19th century, but there are a few older ones. One of the 15th century pews has the word 'prepare' on it, presumably part of a longer inscription. This word is repeated on the 19th century shields in the chancel roof. Two other shields echo the Trinity and Instruments of the Passion symbols vandalised on the font. Another substantial bench end is at the front, on the north side. It carries the shield of the Beauchamp and Fitzalan families, and probably dates from the 17th century, a symbol of patronal power, similar to that at Kedington. The pulpit is beautiful, late 17th century, and a world away from the pew end; I love its formal, delicate arches and egg-shaped reliefs. Into the chancel, which is thoroughly Victorianised, but beautiful and interesting. The benches here are medieval, and carry candlestick pricks in the top of their poppyheads. The glass in the east window was installed by the Rector Francis Storr, in memory of his father, Paul Storr, the Regency designer. The delicacy of the colouring, and the three texts in the upper lights, are most unusual, and a treat. The great treasure of this church is locked away in the vestry - but for your protection, not its own. Shortly after my first visit to this church in the 1990s, I received an e-mail from the then-churchwarden Alan Bates telling me about it, and inviting me to go and take a look. In 1950, when a workman was replacing the floor of the vestry, he had found underneath it a total immersion baptismal font. Since it forms part of the drainage system of the church, it was (and is) full of water. In one of those delightful acts of serendipity, the workman's surname was Dowsing. It hasn't been possible for me to go back and take digital photographs, so here are the ones I took back in 1999 - I apologise for their quality. It is about six feet long and three feet wide, with an extension on the north side for the Minister to stand in. There are steps down from the west end, which is also where the water flows in, draining from some part of the roof. It goes out through an overflow in the east end, probably into the pond which lies beyond the churchyard boundary. It is probably made of stone, although it appears to be made of concrete. The varying layers of water over the years have created brick-like strata markings on the walls. Although there are several other Anglican churches in England with total immersion fonts, all the others are known to be either 19th century or later. So, who put this one here? The most convincing theory is that it was installed by Anabaptists who had charge of the church during the Commonwealth, between 1645 and 1660. This might also help explain Dowsing's warm reception. Another theory is that it is later, installed at the request of a rich evangelical patron. Perhaps we'll never know. I walked outside in the beautiful graveyard. Although the path to St Mary leads off of the main street, the west end of the graveyard looks out over open fields. Here, the gravestones are mostly from the early 19th century, before the coming of the railways, when Otley must have seemed as remote as anywhere in Suffolk. There is nothing that seems so old as the recent past. The 1890s patina to the interior of St Mary is in many ways deeply unfashionable now, even surprising, in an era when we like our spiritual spaces to be light and white. It is hard to imagine nowadays that the 'Christian Virtues' window here would be installed anywhere. But such a time may come again. Time passes. My two year old daughter, whose reflection is caught upside down in the first photograph of the font, is now eleven. And I am older too, content still to be cycling these winding, intensely rural lanes all afternoon, before taking a deep breath for the long descent into Ipswich, and home for tea. Sometimes, I just can't imagine living anywhere else.